All units include: Exposed brick walls surrounding large windows, Granite counter-tops, Double kitchen sink, GE Stainless steel energy efficient appliances (Fridge, Range, Dishwasher, Wine Fridge), Bamboo hardwood floors, Walk in closet, Marble tile in bath floor, 8 jet Jacuzzi soaking tub with Marble or Slate wall surround, European style vanity, Washer/Dryer combo hookup in unit, Deeded off street parking, Deeded storage unit. Connected to the city without sacrificing privacy, Surrounded by nearly 40 acres of conservation land (many trails for dog walking and cross country skiing) and so much more! Association fee includes: Water, Sewer, Master Insurance, Elevator, Exterior Maintenance, Landscaping, Snow Removal, Walking/Jogging Trails, Extra Storage, and Refuse Removal. At Kettle Brook Lofts, we believe that you should have the best of both worlds: Being connected to the best parts of the city, and being able to relax and rejuvenate after a long day. That's why 1511 Main St was chosen. We are surrounded by nearly 40 acres of conservation land, and is just minutes away is Park Ave which features some of the best rated restaurants and bars in Worcester. Worcester Regional Airport (Jet Blue) - In 2018 Jetblue will beging a daily shuttle to JFK in the morning returning at night. This is not only great for NYC, but the terminal at JFK is JetBlue’s hub, from which you can fly direct to pretty much every destination on the JetBlue route map. Easy access to Logan International, T.F.Green and Bradley International Airports. In 1861, Ashworth and Edward Jones formed a partnership and purchased the water rights on Kettle Brook called Valley Falls. A wooden mill building was constructed on the site in 1864 that served as the focal point of a small mill village containing “a handsome mansion and nine tenements” powered by its mill pond. In 1870 the partners built the initial section of the present factory (section “1” on figure 1) which was operated by Ashworth and Jones until their deaths in 1882 and 1885. Ashworth and Jones Woolen Textile Factory was 100 x 70 feet, 4 stories high, and used for the manufacturing of beaver clothe (a heavy woolen cloth, primarily used for over coats). Following the deaths of Ashworth and Jones, the business was sold to E.D. Thayer. Thayer expanded the mills (adding sections “2 & 3” on figure 1) as the business blossomed and continued to manufacture woolen goods until his death in 1907. In 1910, the business was sold to the George E. Duffy Manufacturing Company whose business served across the state in cities such as New York. Consequently, the business grew and expanded (adding section “4” on figure 1). Like the previous two companies, Duffy’s was a woolen mill popular for the manufacturing of coatings and cloaking, however became a warehouse discount store proving company overstock. 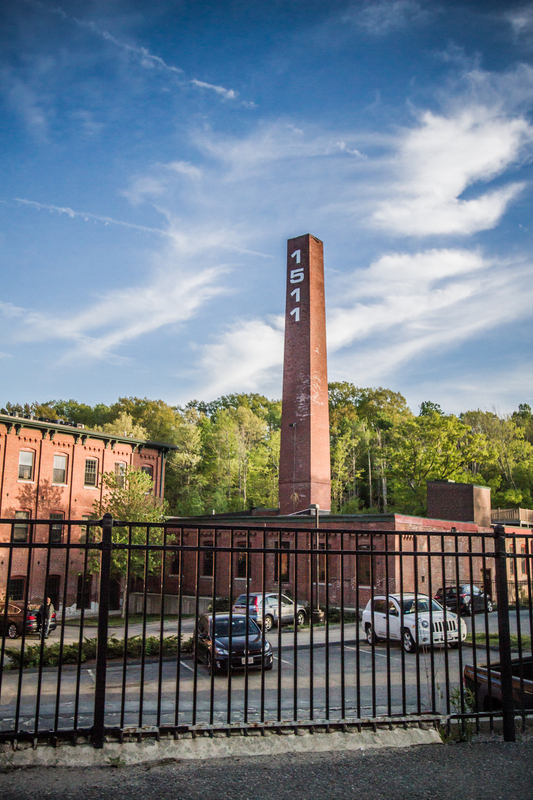 Its popularity allowed the company to prosper for many years until 2005, when Kettle Brook Lofts LLC purchased the historic building and finally, in 2008, renovated and converted it to modern luxury lofts ready for you to make home. "Ashworth and Jones Woolen Textile Factory." Massachusetts Cultural Resource Information System. Accessed January 25, 2016. *All historical photos above were acquired from the collections of the Worcester Historical Museum, Worcester, Massachusetts.